A uniquely complex range of mixed waste has accumulated at Berkeley site since the 1960s. The radioactive waste was from the power station and the neighbouring laboratory complex which carried out research for the UK’s entire nuclear industry. 50 years later, and after a number of failed attempts, we are now retrieving this waste from the underground chambers where it was kept. We are now sorting the waste ready for safe storage in the purpose-built Interim Storage Facility (ISF). Berkeley site housed around 620 tonnes of metallic fuel element debris (FED) and 6,665 containers, some of which are sludge cans, in the 3 vaults. A single silo, meanwhile, houses charge rods and the chutes used to discharge fuel from the reactors. We achieved the first major milestone in March when the chute silo was declared empty. Although we originally anticipated that all the material would be Intermediate Level Waste, a campaign of innovative retrieval techniques and segregation enabled some of it to be disposed of as Low Level Waste or Very Low Level Waste, diverting over 50 tonnes away from the site’s ISF and saving millions of pounds. Following this success, we started active commissioning of the retrieval and process equipment at the vault containing FED. So far, we’ve filled 10 shielded Ductile Cast Iron Containers (DCICs). We dry these DCICs in the conditioning facility before transferring to the ISF. It hasn’t been an overnight success. 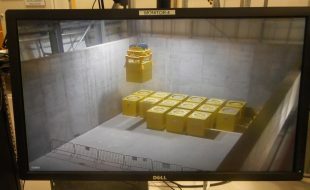 We started designing the retrieval equipment with Cavendish Nuclear back in 2010 and since 2013 we have been working tirelessly on site to build, install and test the equipment. Finally, all the hard work has paid off and to say that we have retrieved waste from the Berkeley Vaults for the first time offers a huge sense of achievement for everyone here at Berkeley, Magnox and the entire supply chain. In 1992, Berkeley was the first Magnox site to complete defueling, and several years later became the first to decommission its storage ponds, while in 2010, its reactors were the UK’s first to enter the passive Safestore phase. 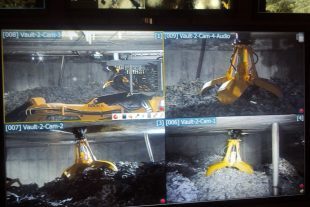 Clearance of the waste vaults is critical for Berkeley’s entry into care and maintenance (C&M).